Who is X the Unknowable? 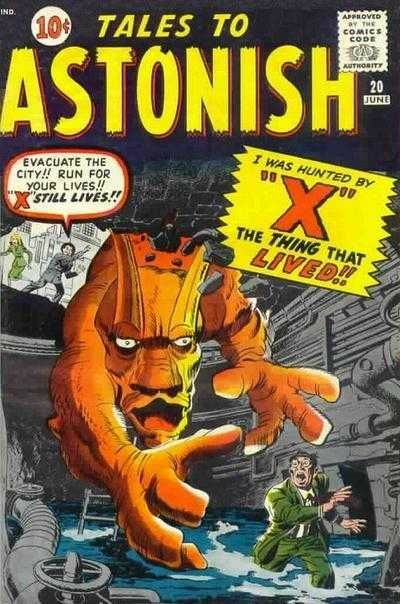 X is a monster that appeared in early Marvel comics in the early 1960s. . This post is part of the Toylab Marvel Monster series that focuses on old Marvel Monsters in preparation for the 2017 Marvel Comic event Monsters Unleashed. X has appeared in recent years as an adversary of Big Hero 6. A comic book writer, Charles Bentley is typing up a script for a new monster story on a type writer. The type writer he working on happens to have a magical enchantment on it that can bring to life anything written on it. Charles is utterly terrified when he realizes the monster X, he was writing about actually came alive. He breaks the type writer which seemingly destroys X. In Japan, X goes on a rampage in an amusement park called Cool World. This is the head quarters for the super hero team Big Hero Six. X's sudden appearance in Japan after seemingly being destroyed is when they find a child with a comic that seemed to foretell X's actions. Big Hero Six recieves assistance from Alpha Flight to battle X. They use the comic story to lure X to Mount Fuji where they seal him. X has not appeared since being sealed in Mount Fuji, however he may appear in the upcoming Marvel event Monsters Unleashed. He does tend to seem more like a magical character. Can seemingly appear magically from mystic items like a comicbook / type writer. His existence seems tied to these items. Once the items are destroyed he seems to be destroyed as well.